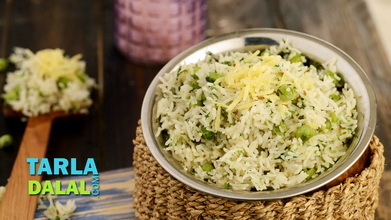 This protein-rich rice preparation also presents a fiesta of colours, thanks to the use of a large variety of sprouts and veggies. 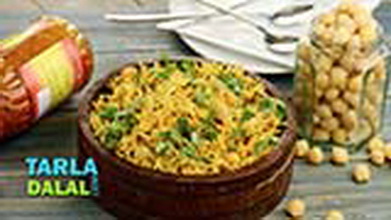 Traditional Indian spices add flavour to the rice, while the innovative use of Pav Bhaji masala imparts a tempting aroma to the vegetable preparation. 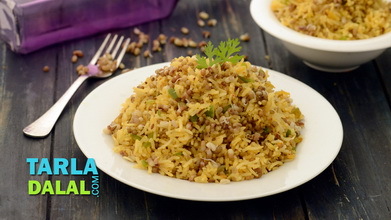 The method adopted, of preparing the rice and veggies separately and then mixing them ensures that this Mixed Sprouts Rice is conveniently moist and not too dry. 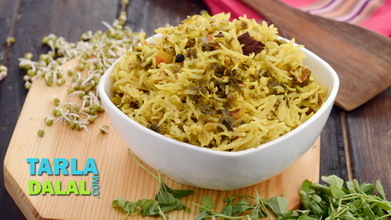 It is as good as having a pulao and a subzi, but in a convenient one-dish format that you will love. 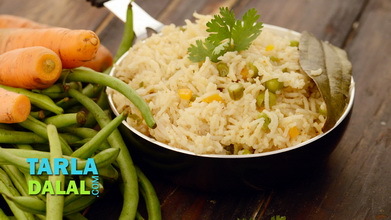 Serve with a raita of your choice, and voila, you have a delicious and sumptuous meal. Heat the ghee in a pressure cooker and add the cumin seeds, cloves, cinnamon, bayleaf and cardamom and sauté on a medium flame for 1 minute. Add the rice and sauté on a medium flame for another 1 minute. Add the turmeric powder, salt and 2 ½ cups of hot water, mix well and pressure cook for 2 whistles. Heat the butter in a broad non-stick pan, add the onions and cook on a medium flame for 2 minutes, while stirring continuously. Add the garlic paste, chilli powder, pav bhaji masala, 2 tbsp of water, mix well and cook on a medium flame for 1 minute, while stirring continuously. Add the tomatoes, 2 tbsp of water, mix well and cook on a medium flame for 1 to 2 minutes. Add the boiled sprouts, boiled mixed vegetables, 2 tbsp of water and cook on a medium flame for 2 minutes, while stirring occasionally. Add the salt and coriander, mix well and cook on a medium flame for 1 minute. Keep aside. 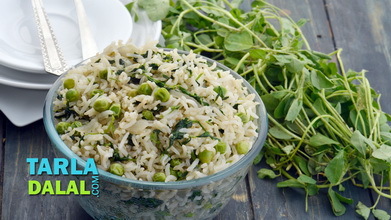 Add the rice into the sprouts and vegetable mixture, mix lightly and cook on a medium flame for 1 minute. 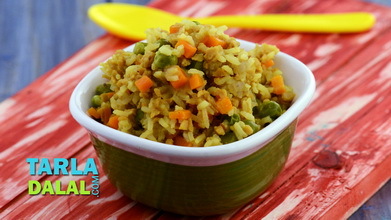 Fill the rice and sprout vegetable mixture in a glass bowl and demould on a plate. 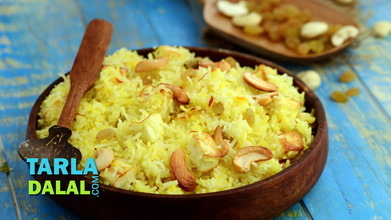 Serve hot with fresh curds or raita or kadhi.